Early this morning a “great” earthquake struck Tokyo Disneyland and Tokyo DisneySea theme parks with an 8.9 magnitude, stranding tens of thousands of guests at the resort. 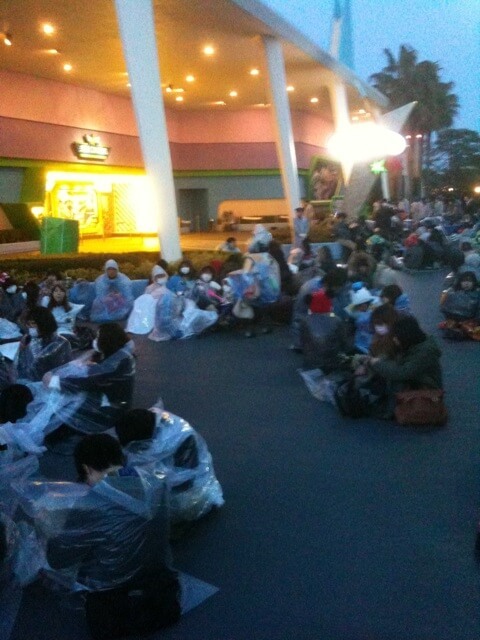 From Main Street to Tomorrowland, guests are lining the park streets, waiting further instructions on how and when they can go home. Details of damage are limited at this point but reports suggest that the Tokyo Disneyland parking structure has been flooded, as have parts of Tokyo DisneySea. There are also reports of cracked streets throughout the parks. 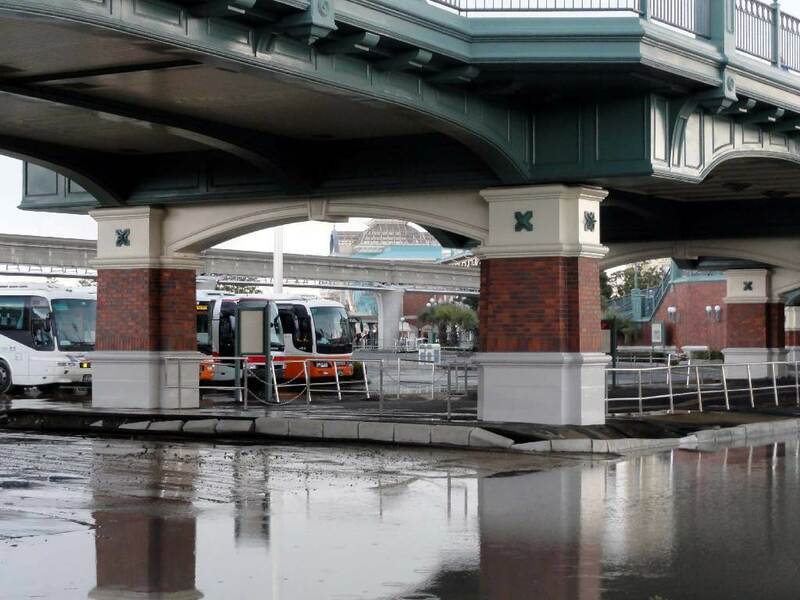 According to The Disney Blog, the flooding appears to be as a result of liquefaction rather than rising water levels. 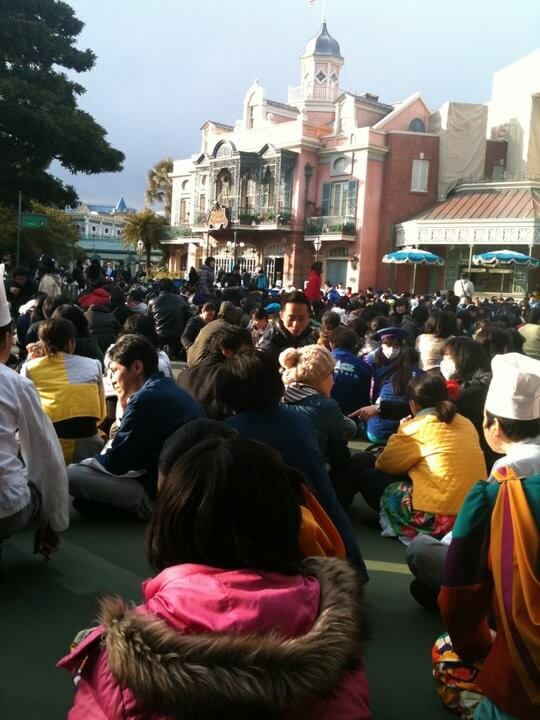 More than 70,000 guests are reported to have no way of leaving, which are closed for the time being. 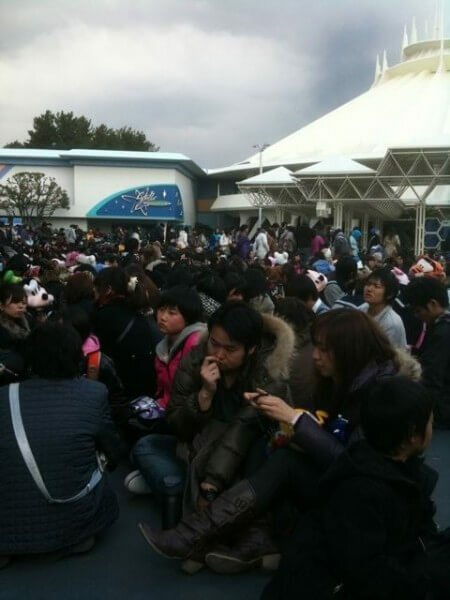 Despite the widespread damage across Japan, no injuries have been reported at Tokyo Disneyland. 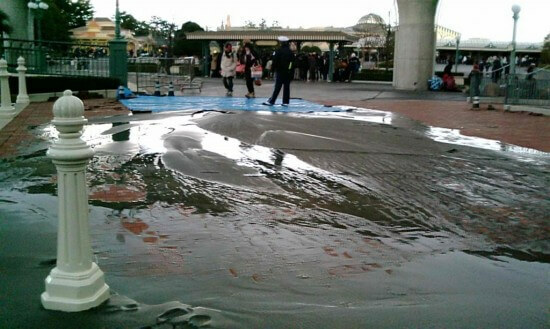 Update: According to @boy33, Disney Imagineer Steve Davison in Tokyo says the parks will be closed tomorrow while everything is checked and no damage has happened to the resort’s hotel. 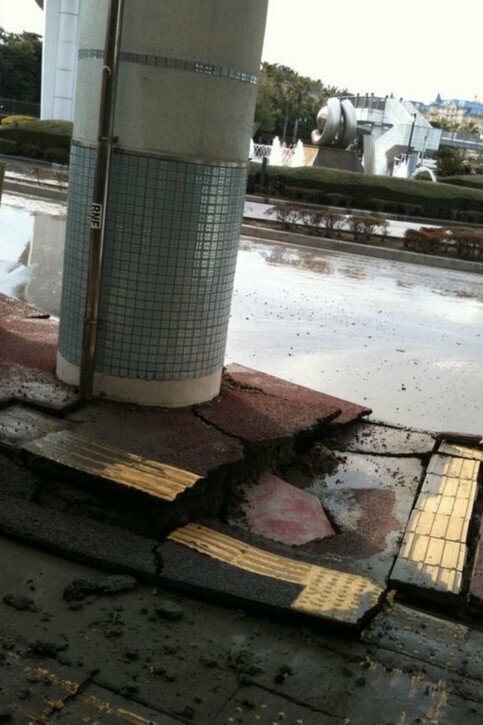 Davison continued noting the tsunami that has caused much of the flooding throughout Japan was just 200 miles from Tokyo Disneyland, leaving the parks relatively untouched when compared to the devastation present elsewhere in the country. 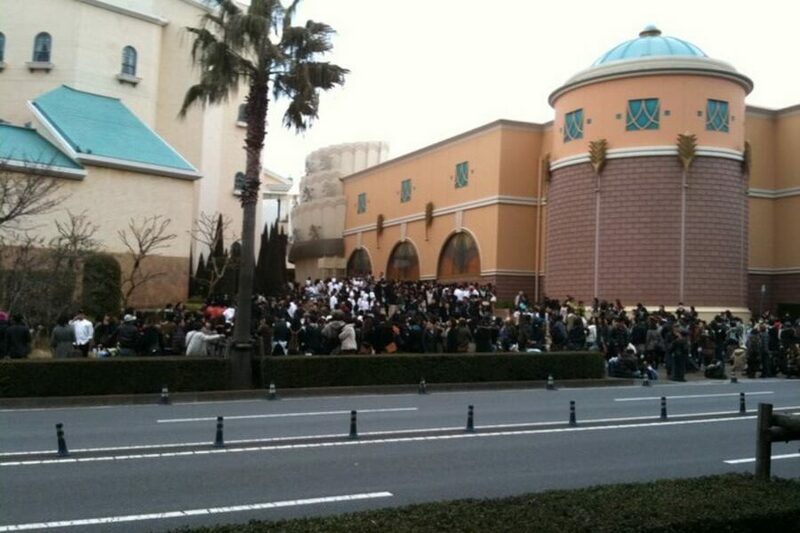 One guest at Tokyo Disneyland told an Examiner reporter, “We need the train to get back to the hotel. 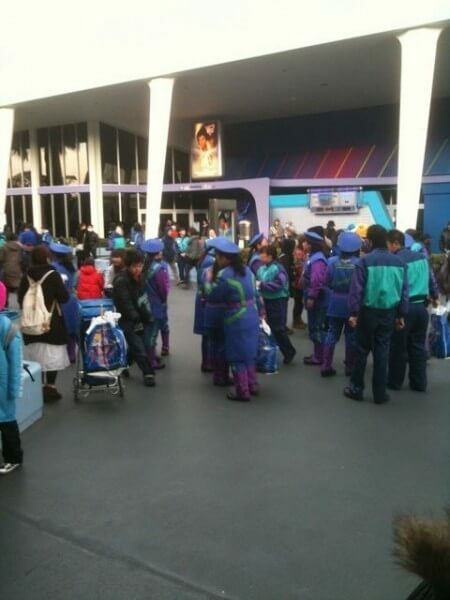 The train is down.” She went on to elaborate, “We are stuck for a few days” at Tokyo Disneyland. She emphasized that all guests around her are safe with plenty of food and no crisis to be found. 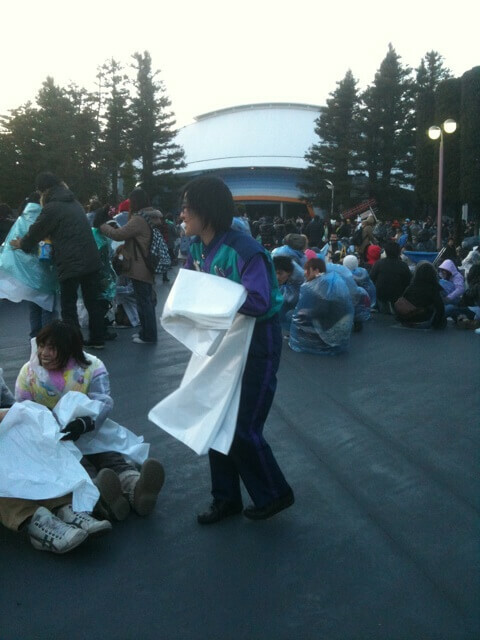 Update: On Twitter, @rezaikram writes that as nightfall approached and temperatures dropped into the 30s, guests were still required to stay in open areas, being given “disposable heaters, plastic bags and rain coats” to stay warm. Guests are not allowed to leave the park for their safety. Update: Reports now indicate that guests are being allowed to leave the park. It is now the middle of the night and limited transportation is being made available. 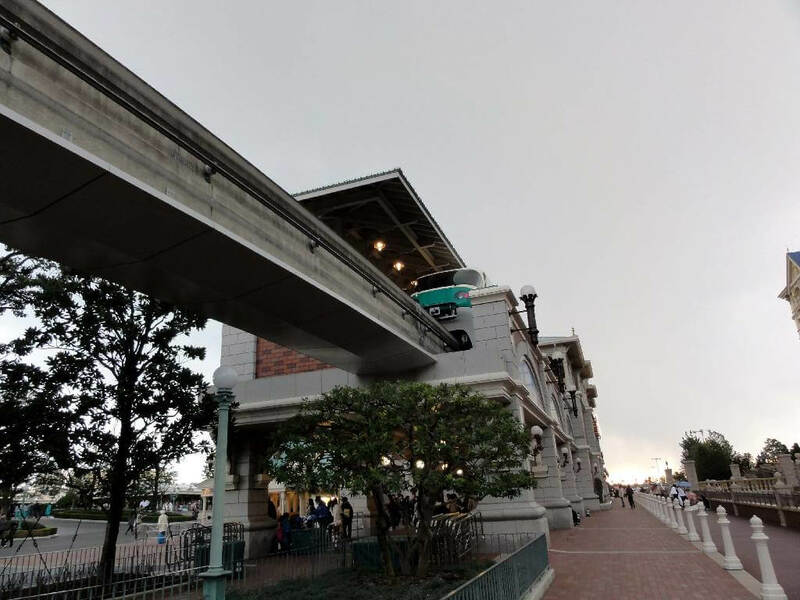 The monorail system is shut down with some damage reported to its beams. Some buses are apparently running. 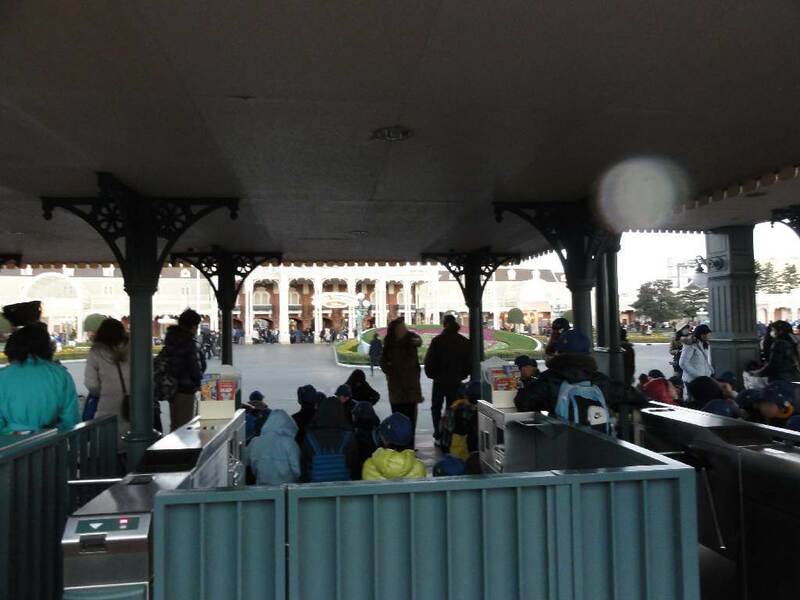 Update: With morning arriving at Tokyo Disneyland, cast members are now serving a warm, welcome breakfast to guests. Disney has also released an official statement, noting that their Disney Wonder cruise ship remains at sea today rather than docking at Cabo San Lucas, Mexico as scheduled. Disney’s under-construction Aulani resort in Hawaii was not affected by the earthquake or tsunami it produced. 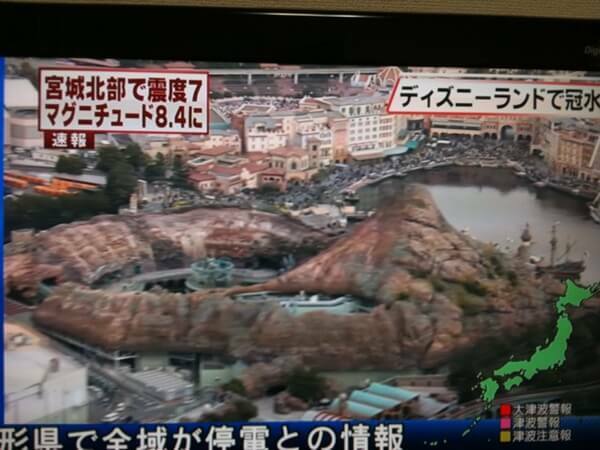 Update: Video has now shown up on YouTube from the time the earthquake hit Tokyo Disneyland, showing a surprisingly calm crowd experiencing the tremors and hearing the news over theme park loudspeakers. Many ongoing reports from Tokyo Disneyland can be found on Twitter. 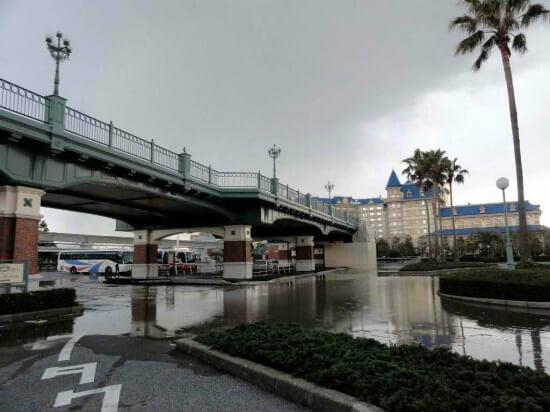 It should be noted that some images depicting flooding are being incorrectly attributed to being taken at Disney’s parks (particularly one featuring a winding water slide, which is not at a Disney park), so all reports should be properly vetted before being believed. Details are limited at this point as to the status of Tokyo Disneyland’s many popular attractions, but it seems that at least the park guests are safe and calm while disaster recovery unfolds. What about the Disney Wonder cruise ship? I have family onboard and they were supposed to be docked in Cabo today, but with the tsunami warnings for the Pacific Coast, I’m wondering if they went farther out to sea for safety. 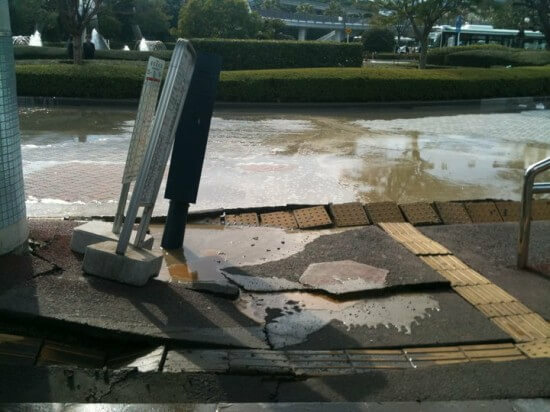 It appears that’s what’s happened, but I can’t find anything concrete, only hear say. Any info would be greatly appreciated! From what I have read, the ship will be at sea today rather than docking at Cabo, as the port there is closed for the moment. Just talked to my son who works on The Wonder. 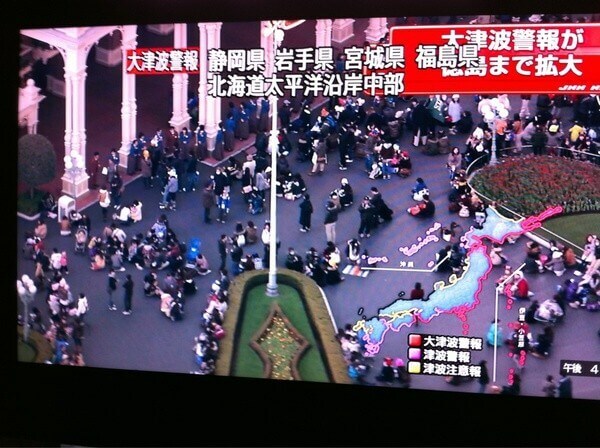 They are staying out at sea. Water is only supposed to rise 12 to 16 inches. 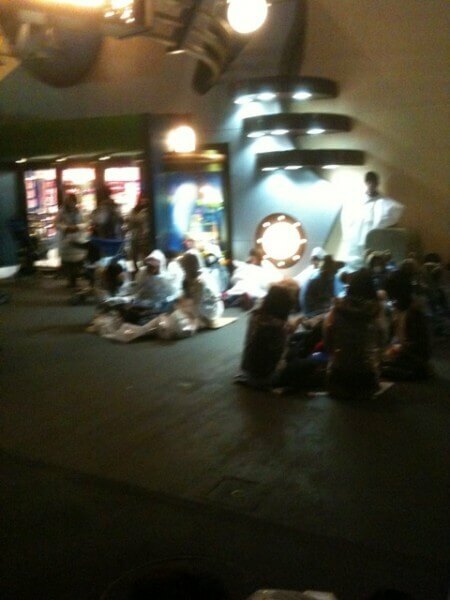 They couldn’t go into Cabo because they have to tender people from the ship. Something about the rise in water and the dock. 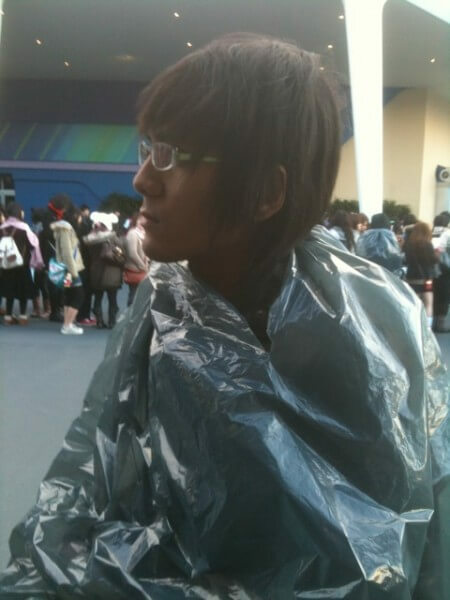 He said they probably won’t even feel the tsunami. Thank you so much! 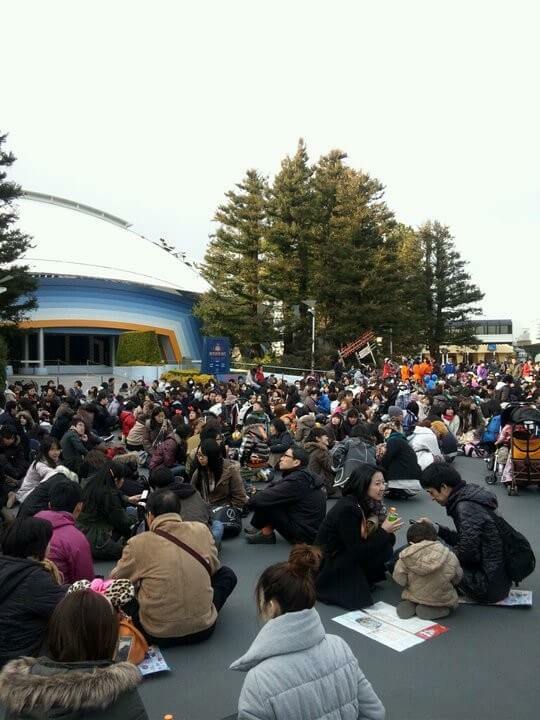 I’m so glad all is well with them. 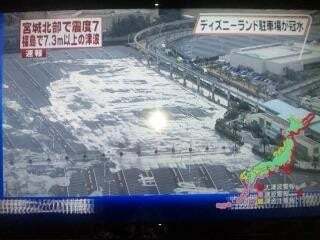 thank God no severe damage there.